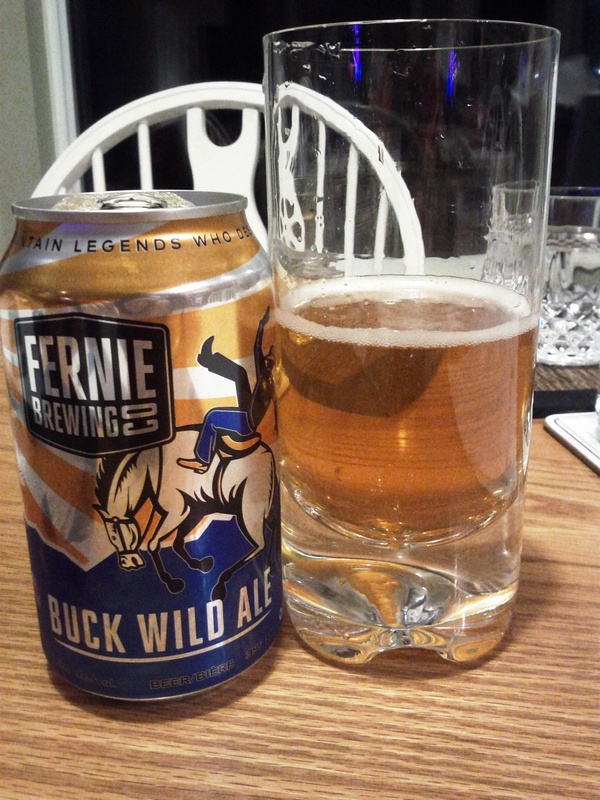 Probably the most dynamic of the additions to the Fernie Brewing Co. lineup, the Buck Wild Ale is a golden blond ale that leaves a mark on the senses. Available in the mixer pack, it was the second of four Fernie beers we have tasted. As some of you may know, I’m not the keenest fan of Belgian/Belgian styled beers. Although I love lambics, fruity Belgian ales don’t typically appeal to my palate — of course, there are exceptions to this (Guldendraak, Piraat, The Stoic Belgian Styled Quad etc.). That said, while I appreciate that the Buck Wild Ale is the most complex and flavourful of the four Fernie beers we consumed, I found it the least pleasant — exactly opposing Tristan! The nose shares a potent fruity, slightly sweet, wheat-like aroma. It is of noticeable Belgian — or Uniqbroue (Quebec) — style, and likely has wheat added, giving it a rather hefeweisen-like flavour. In fact, the wheat is what stood out to me the most, even more than the fruit notes, and, since I wasn’t eating anything, I found the taste rather unappealing. I think Belgian beers are essentially made for pairing with rich, diverse meals; I don’t often enjoy Belgians on their own. While the body is rich, the beer is not too heavy, like some darker — or more alcoholic — Belgian beers. In spite of this, the beer is not too easy to drink, and I don’t think I’d be able to finish more than two in a night. I really liked this beer, and the marks I gave indicate as much. It’s light, fruity, refreshing, but I wouldn’t be able to drink more than a few at a patio party or bbq. Perhaps the flavour just gets to be overwhelming as the night goes on, but it is still well worth picking up! The nose is sweet and fruity, something that carries on throughout the beer, which appeals to a summer afternoon setting. This blond is actually reminiscent to a Belgian or Quebec style beer, as it’s heavier than the colour would indicate and is rich in body. It’s also crisp, but don’t let it get too warm or the taste will change noticeably; best to have this one cold. The malted barley and malted wheat are evident underneath the fruitiness of the beer, and the aftertaste is shorter than I would have hoped. This beer is certainly one I would recommend people try, even if blonds aren’t your favourite style brew. On a hot summers day/evening it would really accompany any salad or fish dish that lands on your patio table. Apparently the first of a series of sour Belgian-style beers, Driftwood released their one-year-oak-aged (American & French Wine Oak) Flanders red last fall. If you’re unaware of this style of beer, lambics are sour, acidic, wine-like beers that have undergone spontaneous fermentation/re-fermentation through exposure to wild yeasts and bacteria, particularly saccharomyces, lactobacillus, and brettanomyces. These bacteria, while not causing any ‘harm’ — toxicity — to the beers, degrade the consistency of the liquid, causing it to impart a ridiculous amount of flavour. The complexity of lambic, or lambic style beers, is unparalleled. Their are many styles of lambics: geuze, which is a blend of young (1 year) and old (3 years or more) lambics; faro, a blend of lambic and freshly brewed beer; kriek, a lambic where sour cherries have been added and the beer undergoes spontaneous re-fermentation within the bottle; and several others, including other fruit added variations, are also considered lambics . Technically, Belgian sours such as Flanders red and Flanders brown, also known as Oud Bruin, are not lambics; they are traditionally produced in a different area of Belgium — West Flanders — use indigenous bacteria to that region, and may use a different strain of malt, such as red malt for Flanders Red. Comparing Flanders red and traditional lambics, such as geuze, is like comparing Cognac and Armagnac — essentially it’s the same thing. In the end, all undergo spontaneous fermentation; all are sour; all are aged in oak barrels; all utilize wild yeasts and bacteria; and all Belgian sours, despite having a similar effect on the palate, are intricate, complex, and, ultimately, unique. When I first had this Flanders red, I was still a novice when it came to sour beers. I had just recently grown accustom to their flavours, but I still wasn’t fully enveloped in the world of lambics. The Driftwood Bird Of Prey Flanders Red is the beer that put me over that edge. Ever since tasting this delectable beer, brewed by my second favourite Vancouver craft brewery, I have looked for lambic or lambic style beers everywhere, and each time I see them on tap — Alibi Room serves Storm Brewing’s Flanders Red as well as a seasonal Oud Bruin from Ian Hill, the Brewmaster at Yaletown Brewing — I jump for joy, knowing I will get to try an incredibly complex, highly flavourful, and relatively obscure beer. When it comes to aesthetic appreciation, of anything of perceptible qualities, even beer, I believe that one must familiarize oneself with the medium and formal intricacies of the work. I typically discuss this notion when referring to art, such as music or film (see my film blog: Aesthetics Of The Mind), but I believe the same fundamental notion applies when it comes to taste as well. From a cognitive perspective, it seems that once one has experienced a particular impulse a few times, it becomes easier for synapses to get the message across clearly — something like muscle memory. So, familiarizing yourself with something, especially something as complex as a lambic-style beer, makes it more approachable, and ultimately, more pleasant. In the end, one may cultivate an appreciation for something that first appeared disturbing; one’s mind just needed to break it down, simplify it, and make it understandable. That said, if you’ve tried a lambic or Flanders red before, and didn’t like it, keep trying. Some people frown at the saying, “you just don’t get it” — it appears condescending — but sometimes it’s appropriate. And it’s not a negative thing, it simply means you’re missing out on what makes this thing great. I know, personally, that sour beers are a taste one cultivates; they grew on me. Now, to the review. 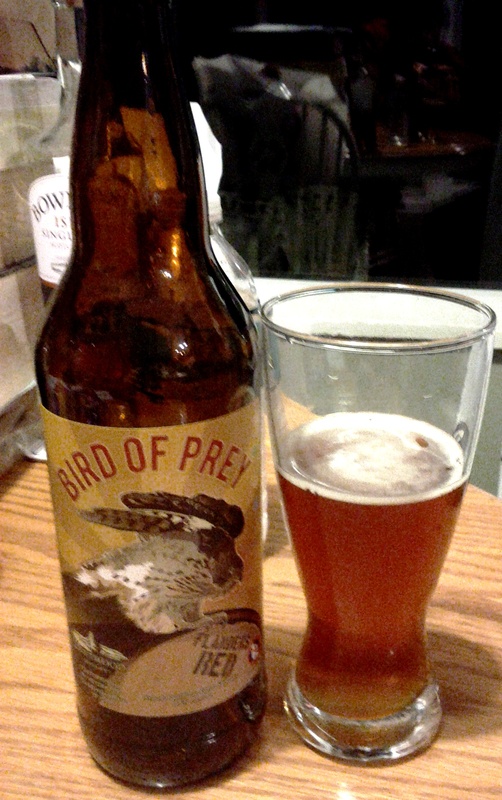 Driftwood’s Bird Of Prey: Fanders Red opens with a strong tartness. A reason many may not get into sour beers is that they don’t let themselves experience anything more than the tartness. Amidst this acidic flavour though, are notes of yeast, barnyard, sour fruit, sweet fruit, sour candy — think cherry warheads — oak, orange peels, wildflowers and bacteria — think rotten fruit or moldy bread, but in a pleasant way, complemented by acidity (yes, I’m serious). The level of sourness differs between all the styles, and even within particular styles; Driftwood’s Flanders red is certainly highly sour, but not extraordinarily so. The sourness is not overwhelming, and I actually find tamer lambics quite boring, so Driftwood basically hit the nail on the head with this one. Despite the sourness, which makes it more of a sipping beer, it’s quite light and easy on the palate. Though I never got to do it with this particular beer, I have had several instances at Albi Room where I drank sour beers all night without tiring of them. While the tartness remains, the level of acid makes the finish extremely crisp. It’s kind of like the crisp finish that a highly bitter IPA imparts, except with a remaining sensation of sour sweetness rather than bitterness — quite an appealing pleasantry. I really wish I had realized it at the time and bought a case while it was available. Well what’s left to be said after an expose like that?!?! Lambic 101 and a review! I’ll keep this short and sweet. This was my first foray into lambic beers and by God did it make a damn fine impression. Even when I first tasted this beer I noted, “a privilege to drink!”, and to the others agreed. While I applaud some of the other lambics available in Vancouver, as mentioned by Kamran, Driftwood’s still stands out as a memorable beer. The nose was appealing and similar to Belgians I had had before (sweet, fruity, even citrussy), but unique unto itself. From the scent alone you could not determine this beer was packing a sourness to it. The body too had a nice mix of sourness and floral belgian fruity combinations that tickled the tongue. It was not overpowering and a nice light consistency. The taste was “zingy” as my notes recorded. 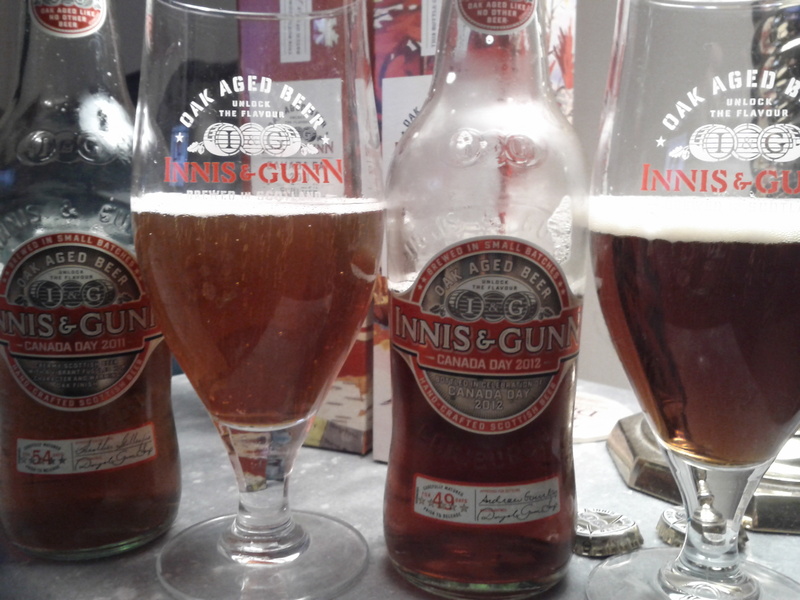 In finish, the beer lingers slightly over a brief period (I wished it would last longer), but is light and makes you wish you could open another once the bottle is finished. Overall this beer put me on the path to try other lambics, which are my favourite variety of Belgian beer. I do hope that Bird of Prey will return again later in 2012 but somehow I feel I shouldn’t set my hopes too high on that as sources say this was a one-off production. I’m just glad I could get my hands on it!